Improbable Press’s second book, The Adventure of the Colonial Boy, is a Holmes/Watson romance set in Australian in 1893. Murder! Dangerous sea voyages! Snakes! Honour, angst, and chases! Unrequited love, requited! Both suspicious and desperate to believe that Holmes may not, after all, be dead, Watson goes as immediately as the sea voyage will allow. Soon Holmes and Watson are together again, on an adventure through Bohemian Melbourne and rural Victoria, following a series of murders linked by a repulsive red leech and one of Moriarty’s lieutenants. But things are not as they were. Too many words lie unsaid between the Great Detective and his biographer. Too much that they feel is a secret. Solve a crime, save a life, forgive a friend, rediscover trust and admit to love. Surely that is not beyond that legendary duo, Sherlock Holmes and Dr John Watson? Add The Adventure of the Colonial Boy to your Goodreads list! Buy The Adventure of the Colonial Boy at Hares and Hyenas in Fitzroy, Victoria (at the store or online). It’s also available in paperback at Booktopia. Already got your copy? A review of one or two sentences on Amazon and/or Goodreads can really help! Melbourne author Narrelle Harris interviewed at the Melbourne Review of Books by Jamie Ashbird and Christopher Johnstone. 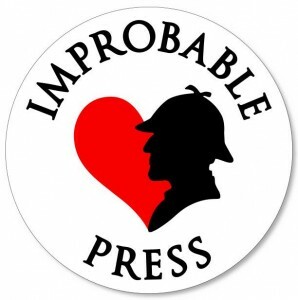 Margy’s Musings interviewed me and Atlin Merrick about the new Holmes/Watson romance publisher, Improbable Press. Jane Routley interviewed me about my writing process, queer interpretations of Holmes/Watson and why women write it. I bought the ebook because I couldn’t wait – and ended up reading it in one day. – Denise, Goodreads.